Brainzo is an Android app where you can play trivia games and win points. Which can be redeemed for Paytm cash. You can download the Brainzo app from the Google Play Store. I was going to review Brainzo a few weeks ago. But they decided to do some changes and the app was inactive. They recently released the update and the app is active again. As I mentioned above what you will earn on Brainzo is “Points”. That can be exchanged for cash. You can earn points by participating in live quizzes. 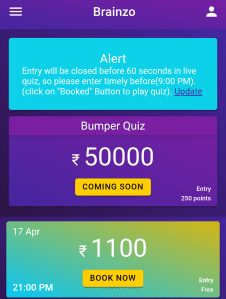 Although the quizzes on the homescreen show prize pool in Rupee, you’ll win points. You need to “Book”/Register the quiz that you want to join. Some quizzes are free while to join others you will have to pay some entry in the form of points. The quizzes have 3 questions that you need to answer within 45 seconds. You’ll win points according to your speed and accuracy. 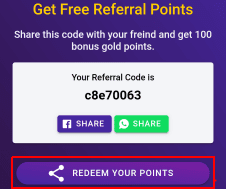 You can earn 100 points when your friends enter your referral code. They will also get 100 bonus points. You can claim your referral bonus by entering this referral code in the Refer to friends section: c8e70063. Referral bonus cannot be redeemed. You can use it to join paid quizzes. You can convert your points(that you won) to cash and withdraw to Paytm wallet. 100 points = Rs. 10.